Gazing at the picture of my thirty-year-old self with a baby in my arms, I had no idea what life had in store for me then. Soon after the picture was taken, I was confronted with the dilemma so many working women face today: dueling priorities of both work and home life. Having arranged a part-time position in the marketing department of a major investment firm, I managed to work a forty-hour job in thirty. There was no balance: just 5 a.m. wake-up times, baby fevers and early pick-ups at child care in the middle of the day. Forget what self-help gurus tell you. Work-life balance does not exist. In my view, work-life balance is a media sound bite that tries to remedy the conflicts working parents face every day. It is a myth primarily because the image evokes the sense that work and life are on opposite spectrums of our existence. In fact, they are not. Anyone with a smartphone will tell you work bleeds into life after hours. If you are an entrepreneur or freelancer, such as myself (I soon discovered Corporate America would not support mothers they way I needed it to), you find yourself working at odd hours. Partly, it’s because we are passionate about what we do. Partly, it’s because our global world demands it. What is possible is aligning your life with your truest purpose. Everything else cascades from that centerpoint. If you know what you are passionate about, your focus will be laser-like and the extraneous distractions that tug at your attention will fall away. I recently chat with CBS This Morning correspondent Lee Woodruff, who is doing the opening keynote address at the upcoming Women’s Leadership Conference in Las Vegas August 14-15, 2012. When she offered up her view of work-life balance, I sat up and listened because her priorities have really been put to the test in her life. For those of you who are familiar with her husband’s story, Bob Woodruff replaced Peter Jennings in the ABC news anchor chair. For 27 days. That is, until a bomb in Iraq struck him while reporting there in 2006. His amazing recovery has been recorded in various places. Here’s one. For someone who has been to hell and back, Lee is a remarkably resilient personality whose sense of humor is certainly her recipe for success (just ask her about the power of flannel nightgowns). Spending a few minutes on the phone with her was enough to boost my spirits skyward. Her writing will do the same for you. She’s just penned her first novel entitled Those We Love Most, which will be released in September 2012. According to Lee, “there isn’t a balance. It’s a myth that we’re chasing. And we’ve done women a big disservice to say they can have it all.” She referenced a recent Atlantic Monthly article by former director of policy planning at the State Department Annie-Marie Slaughter that claims the current workplace and society at large are not equipped to deal with family life as a holistic part of an employee’s existence. The personal and the professional are held separately and not valued equally. Slaughter suggests that someone who trains for a marathon and puts in the early and late hours to reach his goal is considered disciplined, committed and admirable. Someone who puts in the same hours caring for a family is not regarded the same way. Glibly put, family life, should it interfere with work at all, is regarded as an unspeakable part of yourself, like gastrointestinal issues. In current times, it is unprofessional to mention you might have a life beyond your cubicle. Society dictates that you are ‘less than’ when you show you have family commitments outside of work. You are somehow subpar to those who really ‘dig in’ and don’t let pesky distractions such as a sick child or school matters interfere with more noble pursuits such as the bottom line. In fact, I have been told to say I have an off-site meeting to clients when really I’m attending my child’s concert. I was instructed that it is unprofessional to speak of such matters because it would indicate my attention is not 100 percent on the client himself. No one places 100 percent of their attention anywhere. That, too, is a myth. We need to redefine what professionalism means. We are not robots. We are social beings in a broader network with other social beings. When will family life be as hip as Facebook? Lee admits that she cannot have it all and that, whilst on the speaking circuit, her children aren’t going to get that home-cooked meal. She says you can still be a great mother and miss a few sports games. The trick is self-forgiveness. “We’re calibrated as working women to have an entire sense of guilt because we can’t chase it all. Once we become kinder to ourselves, the whole thing is a lot easier to manage,” she admits. In those moments when she has her kids on the phone complaining that she’s not there for a special event, she gives herself a pep talk afterwards. She knows she is there for the big things in their lives. With twelve-year-old twins and two older children, Lee has come to realize they will survive without helicopter parenting. In fact, they will do better as a result. “Stay the course,” Lee advises. “We are the best judge of what is going on with our children.” Mindful parenting does not mean you are a hovercraft. It’s time to toss the balance beam out the window and get real. Alignment with self, family and work is where it’s at. 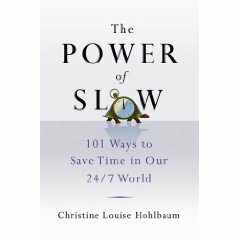 Want more slow? Visit my PT blog! Are You a Life Architect? How Big is Your Stress Box?